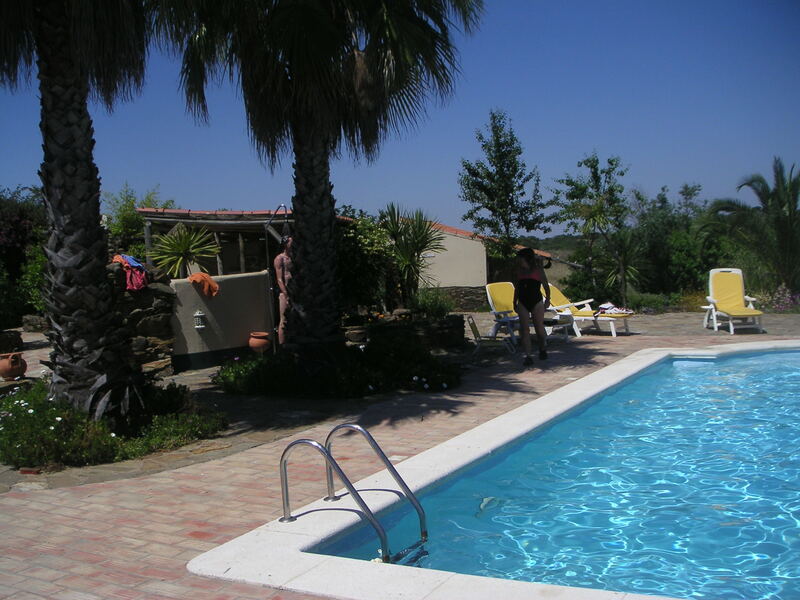 Today we went to Ourique for a swimming pool party at Mahadevi’s place. She lives off-grid in a Hollywood style villa with her own lake, solar powered swimming pool and fontain, greenhouses and fruit trees. You would think that she won the lottery but her luck is that the owners of this mansion are actually paying her to live there because she is a good caretaker. She certainly took good care of us today! Swimming is an excellent form of exercise, practiced by humanity since the Stone Age. Around midday in our warm and sunny climate it is also nicely refreshing. 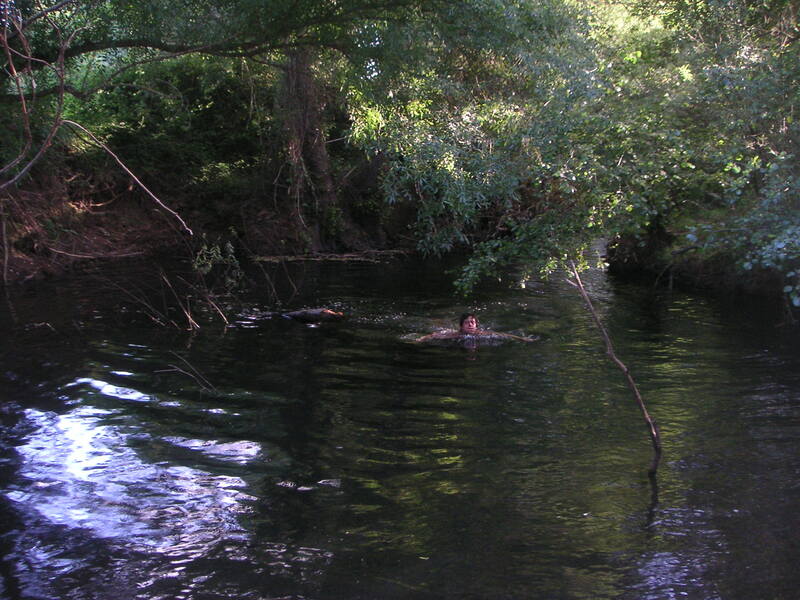 We are planning to make a natural swimming pool just behind the house, but fortunately there is also a little lake in the river that runs along our garden, shaded by many trees, where some of us jump in every day from the gravel beach. We are planning to make several large tents and yesterday the first dome shaped tent structure was bolted together from 65 steel tubes. A shape like this is called a Geodesic Dome, it is very strong and light weight. 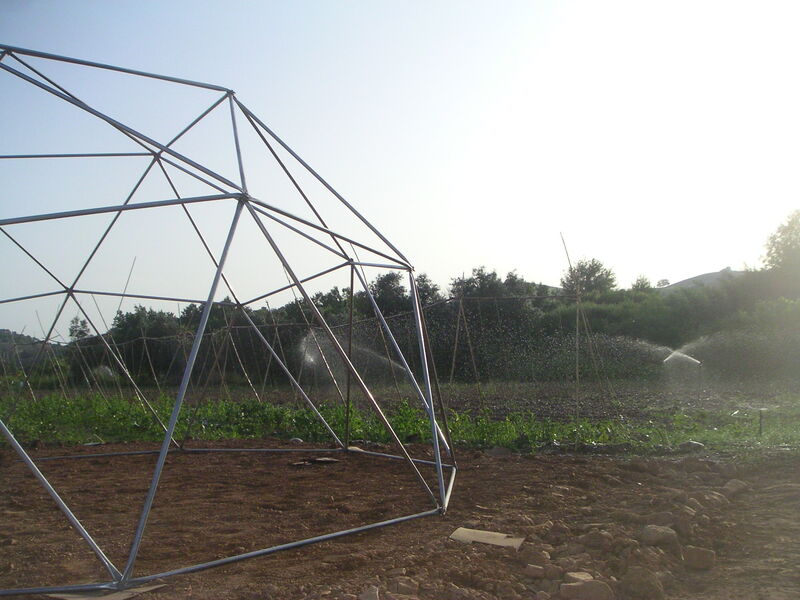 This first tent will be an arbor for the gardeners and also for storing our gardening tools and seeds. The next step will be to make the covering of coated fabric. Growing a spiritual community is a bit like gardening. You need to nourish your plants with good compost. Therefore the essence of the community may be found in the meditation room but the real secret is in the kitchen. 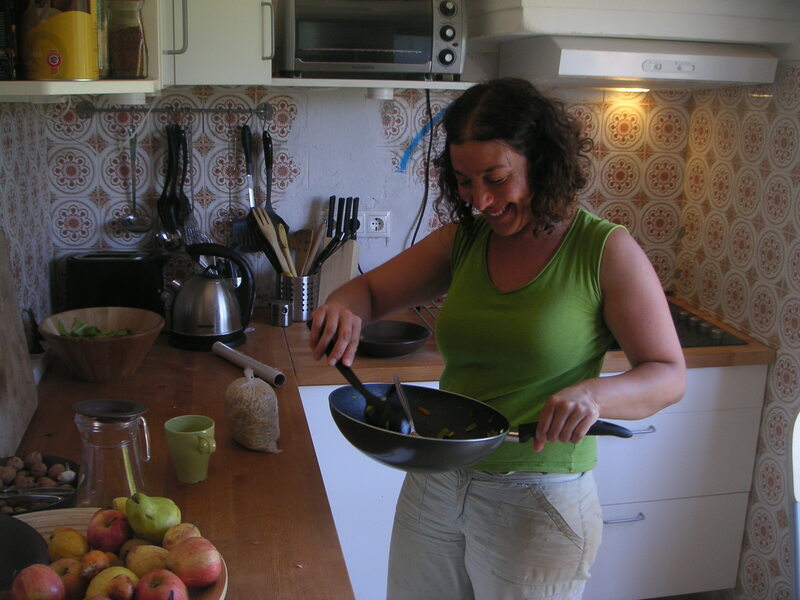 Latifa has prepared us many delicious meals since the beginning of April but she needs to go elsewhere coming Monday. Know anyone who is interested to be our new Chef de Cuisine? Tell me! The beaches near here are among the most beautiful in all of Portugal and the one we visited today even offers a natural fresh water shower in the form of a waterfall coming down the cliffs. 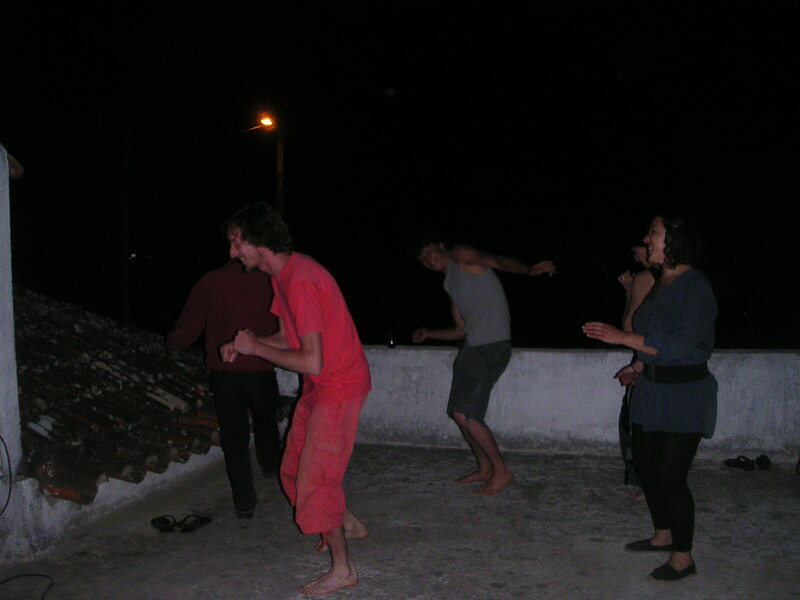 After our swimming party we had a dinner party on our roof terrace after which we danced by the light of the stars to the tunes of our new DJ Marien, in celebration of Anudip’s thirty second birthday. Recycling organic waste from the garden and kitchen is easy and efficient. 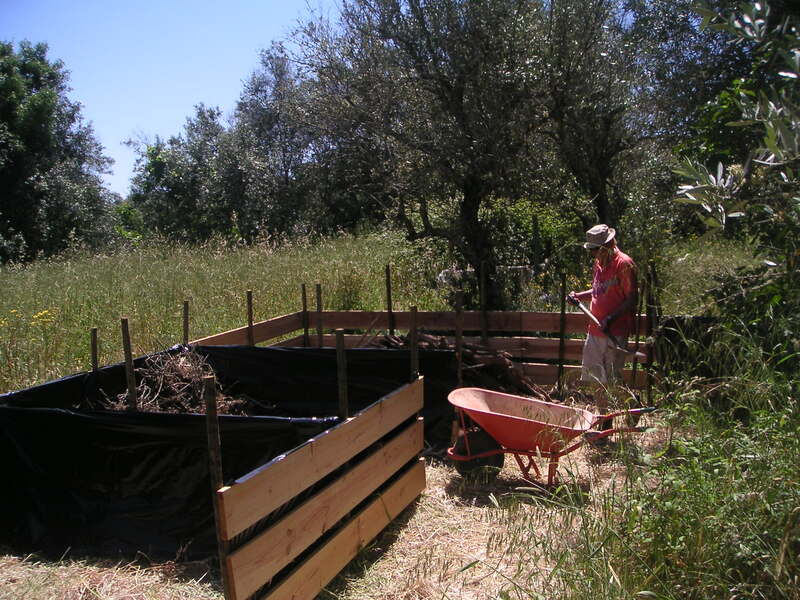 Composting requires little effort and produces rich black soil. All the work is done by friendly aerobic microbes, you only have to watch and take care that the pile doesn’t dry out or gets too wet. 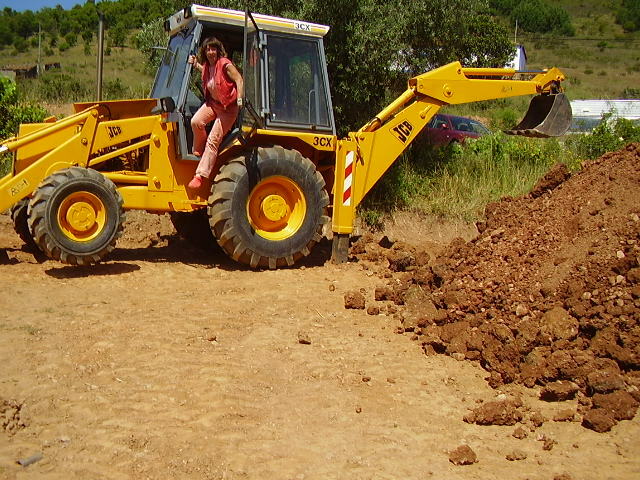 It can be done as an open pile but we prefer to have an enclosure and Navino offered to make it. He is now finishing and already starting to fill it. We can’t get enough of her, but it takes a lot of practice to get it right. She is very strong and easily breaks things. It’s amazing to watch her eat up a ten inch concrete tube, hidden in the ground, as if it were a candy bar. We are impressed but not pleased as we need more digging now to get it repaired again. In the picture Mahadevi, a former bulldozer operator herself, checking her (and my apple pie) out today.